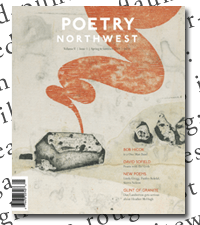 The next print edition of Poetry Northwest will be the spring-summer issue, due in April 2010. Until then, in addition to our regular monthly highlights from the most recent issue (see Natasha Trethewey’s “Mexico,” for instance), we are publishing new poems by poets we admire as a countdown to and preview of our back-in-Seattle debut. In January, we featured Eric McHenry’s “New Year’s Letter to All the Friends I’ve Estranged by Not Writing.” February gave us “Hall of Sea Nettles,” a new poem by Paisley Rekdal, rich in sinuous assonance and shifting, sharp-eyed imagery. You can expect to see more poems by Paisley Rekdal in the spring-summer issue to come. Now, on the threshold of our new issue, we are pleased to present Marvin Bell’s “The Book of the Dead Man (The Northwest).” The Dead Man has been a stalwart of Amercian letters since his debut in 1994. His resurrection here is sure sign that spring is upon us again.